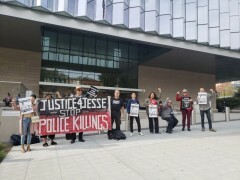 Court sides with L.A. cop who murdered Jesse Romero | Fight Back! Los Angeles, CA - In an outrageous decision, the jury sided with two-time killer and Los Angeles Police Department officer Eden Medina. The civil rights violations trial on 14-year-old Jesse Romero's killing started November 13 and lasted only six days. Early in the preceding, a judge ruled to exclude key evidence from the proceedings. Killed on August 9, 2016 Jesse Romero was visiting his friends at the apartment complex in Boyle Heights. Someone inside of the apartment complex called 911 saying Romero and another teen were potentially smoking marijuana and graffitiing. LAPD officers Eden Medina and backup partner Alejandro Higareda bought the call and snuck up on Romero. “No, I didn’t see him committing a crime when we got there,” said Officer Medina during the trial. But that didn’t stop him from killing Romero. In 2016, news of multiple killings by LAPD in Boyle Heights were on the rise. These killings included the murder of young Chicano Omar Gonzalez - who Medina had also killed just 12 days before Romero’s killing. Knowing the historic role cops have played in killing Chicanos, Latinos, and Blacks, Romero ran for his life. The pursuit ended with what an eyewitness and Boyle Heights resident verified as a cold-blooded killing. The jury didn't seem to care about this witness’ statement, even though she was the only witness to take the stand who saw the actual shooting. Represented by his cop union, LAPD officer Eden Medina was equipped with an all-white legal team. Jesse Romero's family was represented by Chicano Attorney Humberto Guizar and a great, mostly oppressed nationality legal team. Lawyers representing LAPD officer Eden Medina presented the case as the necessary killing of a typical gangster, looking to ambush two cops. “He refused to follow commands. Even using profanity didn't stop him,” said a Medina attorney. They did everything possible to make the jury lose sympathy for Romero, even arguing that 14-year old Romero had the build of an adult male. LAPD officers Medina and Higareda are both larger in build, height, and were much older than Romero. Boyle Heights has a 35% obesity rate due to poverty and inadequate access to recreational sites. However, Medina’s deposition acknowledged that he knew Romero was between the ages of 13-16. LAPD expert witness Ed Flosi testified that when using deadly force, a cop must have, “Reverence for life, all life.” A stealth nod to the “All Lives Matter” phrase used by racists. After closing statements, Medina’s attorneys argued to Judge Dolly Gee that Romero’s parents were inadequate parents and should not be awarded a cent by the city of Los Angeles. Judge Gee denied the request. After only a few hours, the jury returned to announce they were unanimous in deciding against Romero’s family. U.S. Marshalls were called to secure the courtroom upon the reading of the verdict. Present throughout the trial were other mothers who had also lost their children at the hands of police or sheriffs. Taking every moment of the trial personally, including the decision, these mothers gave Romero’s parents utmost support. Upon exiting the final day of the verdict, a group of Romero supporters chanted, “Say his name! Jesse Romero!” to which no security guard at the federal courthouse dared challenge. Centro CSO, with allies like Black Lives Matter, held daily protests outside the U.S. courthouse before entering to observe the trial. Humberto Guizar, the Romero family attorney, will file an appeal asking for a new trial. The basis for the appeal is the court did not allow the entering of evidence on the prior killing of Omar Gonzalez by Eden Medina 12 days earlier. 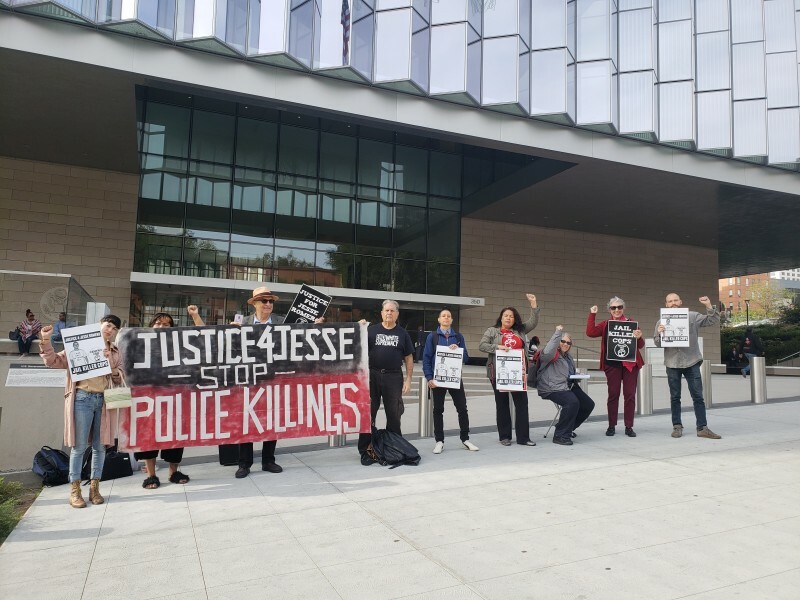 Centro CSO and other families will continue to demand justice by demanding District Attorney Jackie Lacey prosecute killer cops and by continuing the struggle, protesting in the streets and in the courts. Sol Márquez is a member of Freedom Road Socialist Organization, Centro CSO, and a fighter for Chicano liberation.